Jewish Home Ministers Naftali Bennett, Ayelet Shaked join Zeev Elkin in opposing PM's plan to remove metal detectors from Temple Mount. While the Security Cabinet voted Monday night to remove the newly-installed magnetometer metal detectors from the entrances to the Temple Mount, bowing to pressure from the Waqf and the Jordanian government, not everyone in the cabinet is happy with the move. At least three ministers in the cabinet, Arutz Sheva has learned, voted against the proposal brought by Prime Minister Binyamin Netanyahu to accept the Jordanian demand and remove the metal detectors. In addition, the cabinet decided that security cameras installed around the entrances, which had been placed there prior to the terror attack near the Mount earlier this month, would also be removed. In place of the metal detectors and security cameras, the cabinet voted to implement “smart checks” using “advanced technologies”, the government said in a statement. 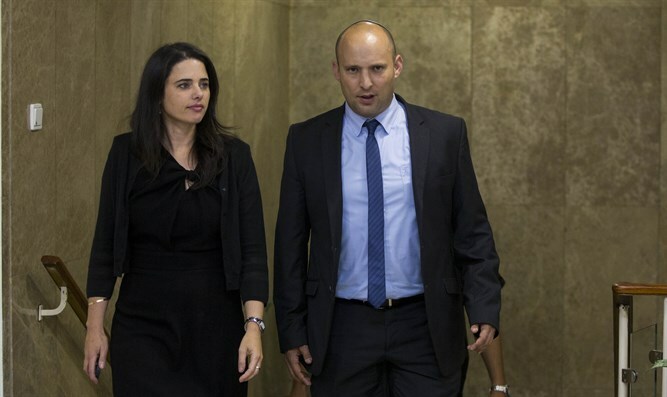 Education Minister Naftali Bennett and Justice Minister Ayelet Shaked, both of the Jewish Home party, were joined by Jerusalem Affairs Minister Zeev Elkin (Likud) in opposing the plan. The three have refused to comment on the cabinet meeting, but sources with knowledge of what went on at the meeting informed Arutz Sheva that the three protested the plan, and argued that at the very least, the security cameras should be left in place. Some of the security experts consulted by the cabinet endorsed the position held by ministers Bennett, Shaked, and Elkin, though others argued that anything short of the total removal of all observation and detection equipment at the Mount would fail to calm tensions. Advanced magnetometer metal detectors were installed in front of the entrances to the holy site after three Israeli Arab terrorists murdered two Israeli Border Police officers near the Temple Mount on July 14th. The terrorists reportedly smuggled the weapons onto the Mount and stored them in a mosque with the assistance of several Waqf employees.